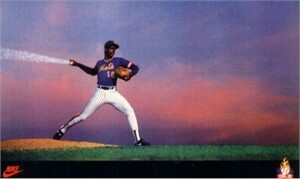 3 by 5 inch Rookie Card of former New York Mets superstar pitcher Dwight Gooden issued by Nike in 1985. NrMt. ONLY FOUR AVAILABLE FOR SALE.